We’ve been hunkered down, waiting out the cold, but not hunkered down as much as our eight barn cats–they’re almost in hibernation mode, piled on top of each other in their cat house cribs. Still, work continues for me and Jill inside the house, where we’ve finished two big projects: the guest room and the kitchen. 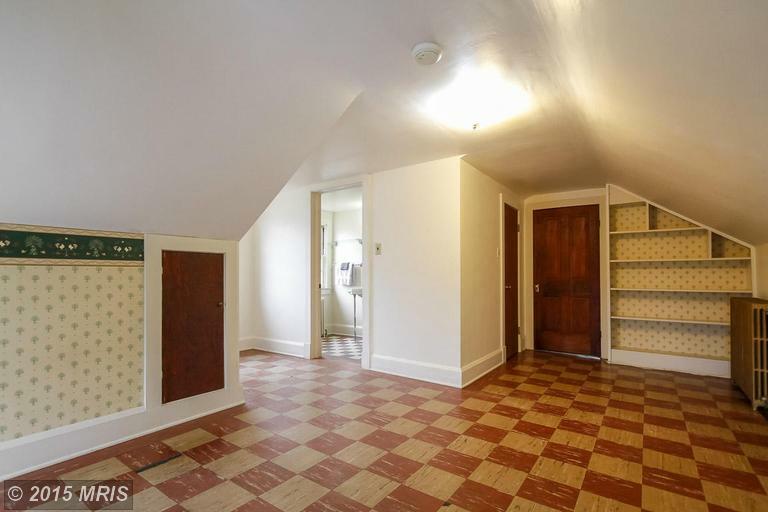 In 1959, the original owners of the house nailed plywood to the farmhouse floors, then covered that with linoleum, for an “updated” look. Getting up all of that–with prybars and nail-pullers–was a messy, muscle-straining job. Then both rooms needed new electricity. 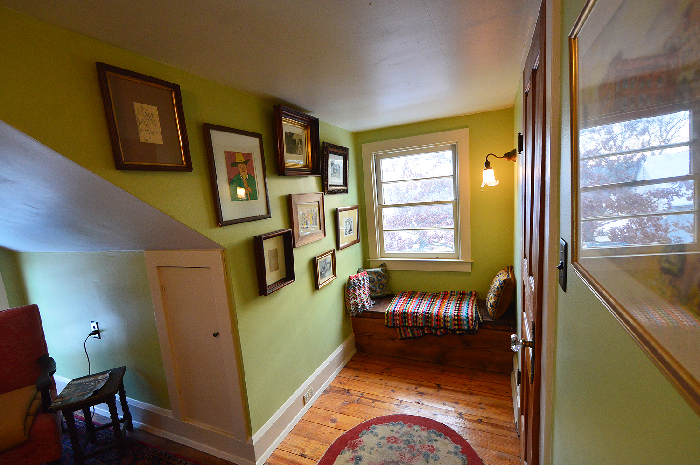 In the guest room, which sits in the attic, adding electricity meant pulling up floorboards to run the wires. 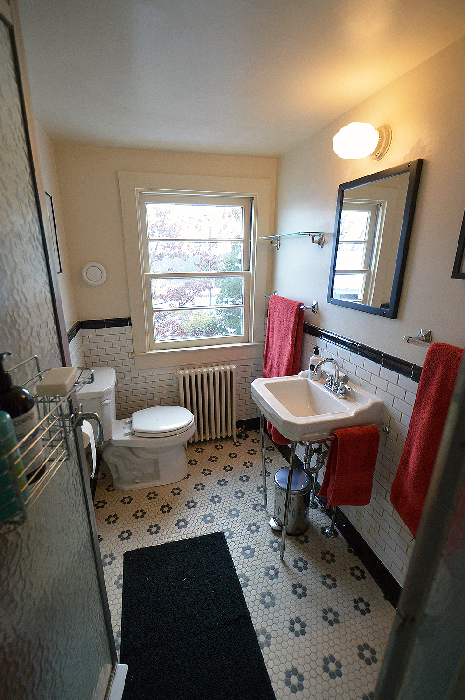 The guest room has its own full bathroom, which I had to strip down and tile. I’d done some tiling before, but nothing like this. Suffice it to say, I learned a lot. The best lesson: use mastic (glue) instead of thinset (mortar). 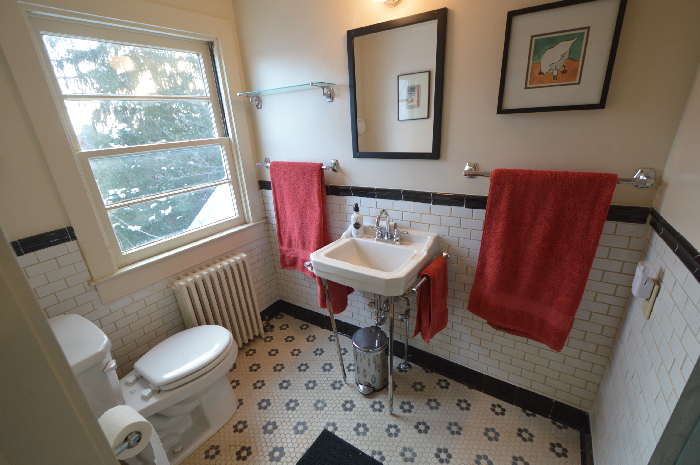 Thinset is much cheaper but also much messier and much less consistent–inevitably, your tiles will sag. Mastic makes tiles stick fast and hard. 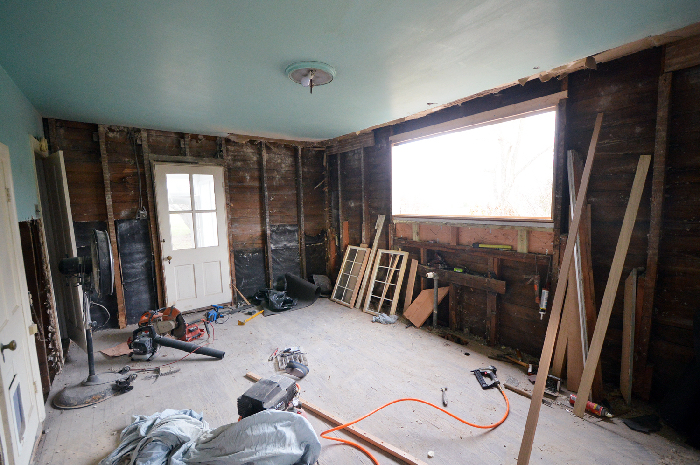 The guest suite makeover took more than a month of consistent work. We’re going to decorate it like a boy’s room: the bookshelf holds a collection of boys’ adventure books (1900-1920s) that we found in the attic. We’ll add more children’s books, a model airplane, and who knows what else. 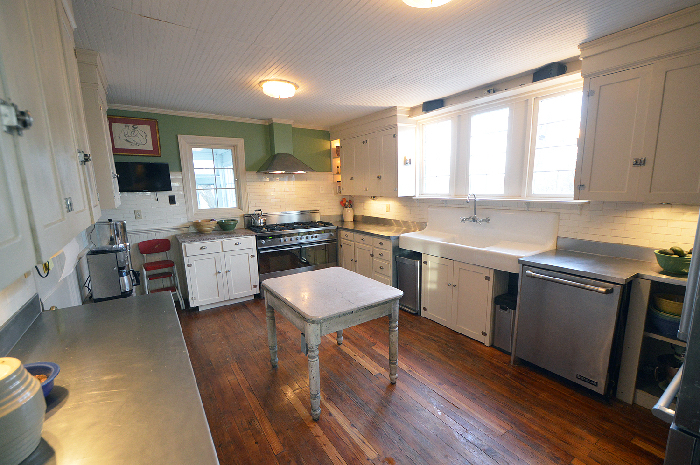 The kitchen: oh, my. It was the biggest house project because we had to start from scratch. 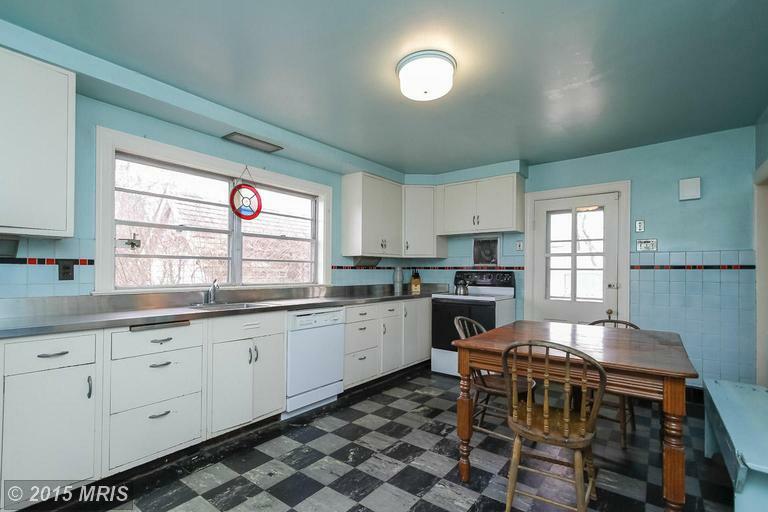 The updated 1959 version looked kind of cute at first glance but, in actuality, it was a wreck: rusty metal cabinets, decrepit appliances, metal tiles (that’s right, metal) on the walls, linoleum on the built-up floor, no insulation in the walls. We took it all down. I joked: the guy who installed the 1959 version must have been a bunker builder–he installed walls on top of walls and a second ceiling over the original. It was hell to remove all of that. Jill has taught me to be bold when renovating. 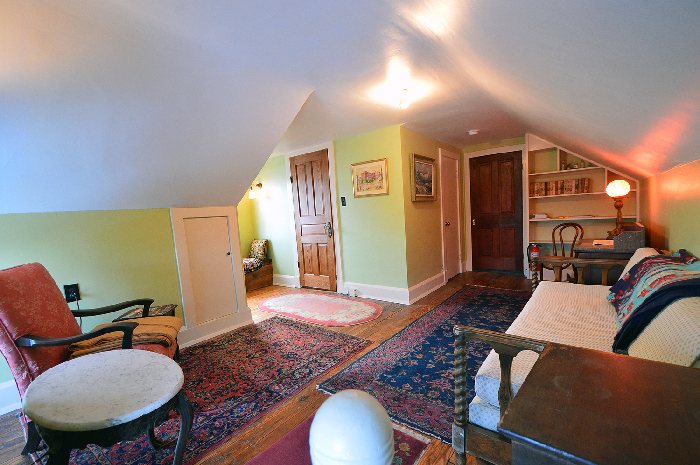 Unless there’s a truly historic feature you ought to preserve, there’s no reason to observe the original layout of any room. In this case, we removed the huge original radiator and put a smaller one in a different location. 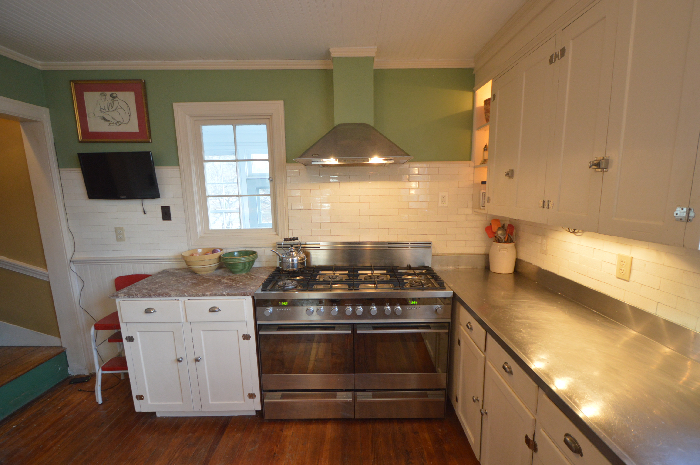 Then I took out the back door and made thsy opening into a window so that we’d have room for our big, six-burner range. 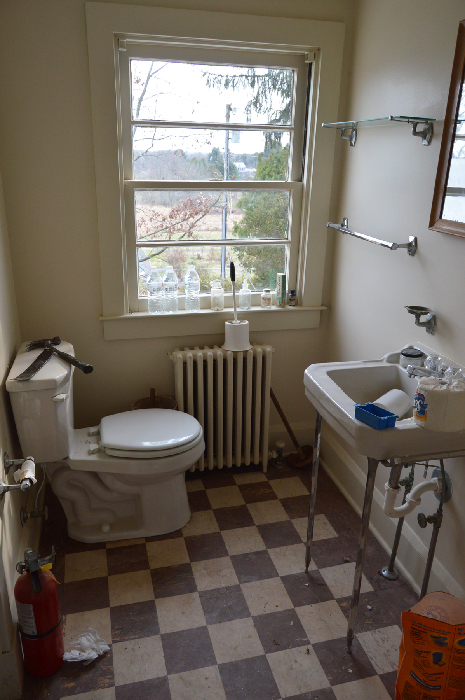 I replaced the 1959 sink window with something that looked older and I installed it higher to accommodate our farm sink. The cabinets were most problematic. I custom-built a set, using some cool windows we’d found at salvage. 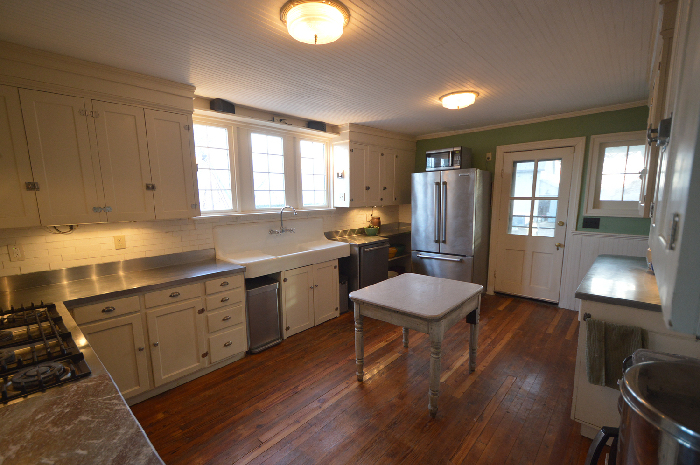 But the cabinets extended too far down the wall, obscuring the counter space. So I had to tear them out and try again. 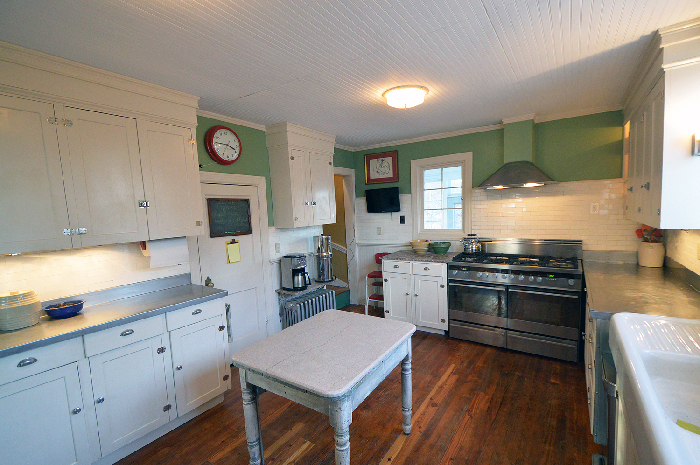 Eventually, we found an old set of solid wood cabinets, almost a Shaker style (very simple) at a salvage warehouse. Then, with a friend’s help, I boxed them up to the ceiling with crown molding. I had a couple of metal fabricators salvage the old stainless steel counter and build a couple of new ones. I cut some salvaged marble for the other counters; then, with vintage subway tile, I created a backsplash that runs around the entire room. 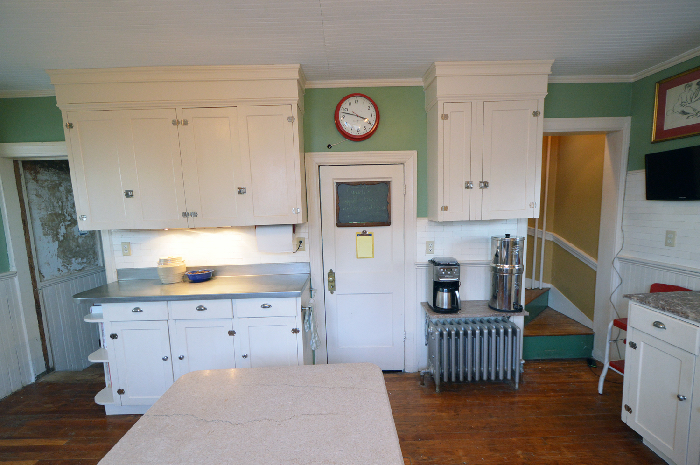 The final effect is that, with the exception of the new appliances, the kitchen looks original to the house, circa 1920. You’ll notice I’ve mentioned “salvage” a lot: virtually everything in the kitchen is old stuff we’ve bought at auctions, flea markets, and salvage warehouses. Had I to do it again, I would have put down a new wood floor. But deadlines and other exigencies forced us to get the kitchen up and running sooner rather than later. That’s the theme we must live with: nothing is perfect.